I am slowly getting things back together in the kitchen. I made dinner for the first time in 3 weeks the other day and have done a couple of loads of dishes. Doesn't sound exciting? Well, it is to me. I realize a lot of people who love some rest time but being forced to do nothing is maddening. Starting to feel like a real person again is nice. 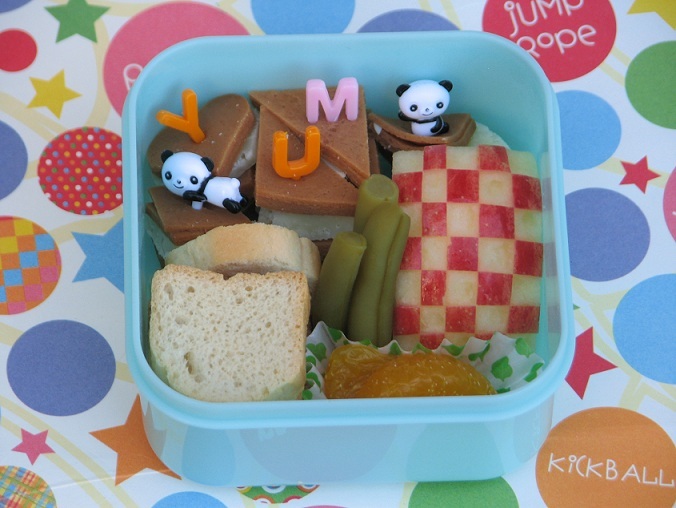 Kidlet had a teeny bento again the other day. On the side he did have a yogurt as well. This container has soy ham and manchego cheese on adorable skewers of awesomeness, tiny toasts, green beans, checkered apple, and mandarin oranges. So happy for your good news!! I just had to say that I love your site. I look at it all the time. Also, I had a hyseterectomy in September at age 28. THE.BEST.DECISION.EVER! You will be much happier with life now, I can promise you that! So adorable! And so glad you are on the mend!